Notice anything interesting about this picture? 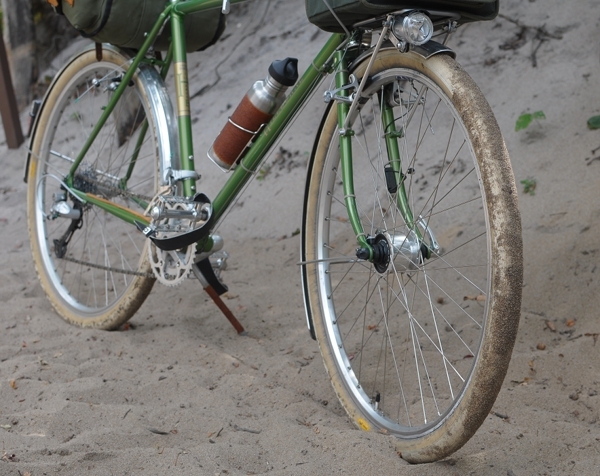 Here is a closer look - And yes, the bicycle is standing in the sand without a kickstand! 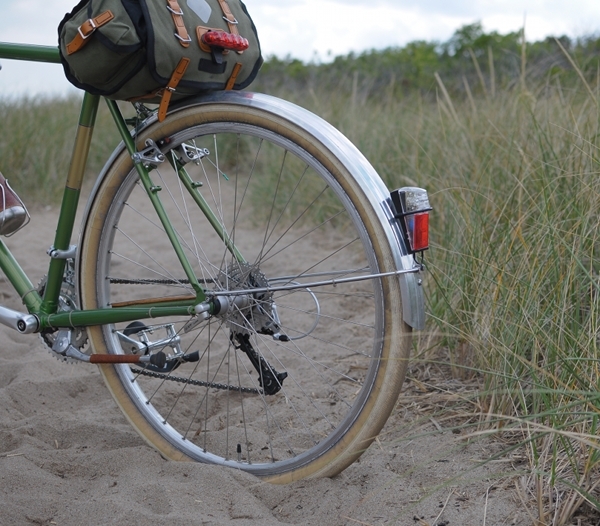 The Grand Bois Hetre tires are 42mm wide and the Velo Orange "Zeppelin" fenders fit over them nicely. Made to resemble the French randonneuring tires of yore, Grand Bois Hetres are available with either white or red tread, and they are made for 650B wheels only. The white tread version is really a cream colour with tiny little caramel specs, and the red version is really a brick colour. Both look beautiful. The picture above is the only one I have of the tires looking shiny and new. After 1800 miles, this is what they look like now. Considering that I haven't cleaned them, I don't think that's too bad actually. And this is what they look like after going through sand in the rain - though all that caked sand comes off almost immediately once you start cycling on a paved road. 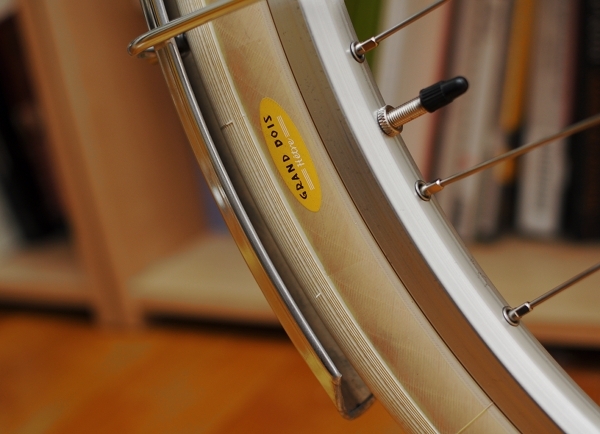 The ride quality of the Grand Bois Hetre tires is truly superb. 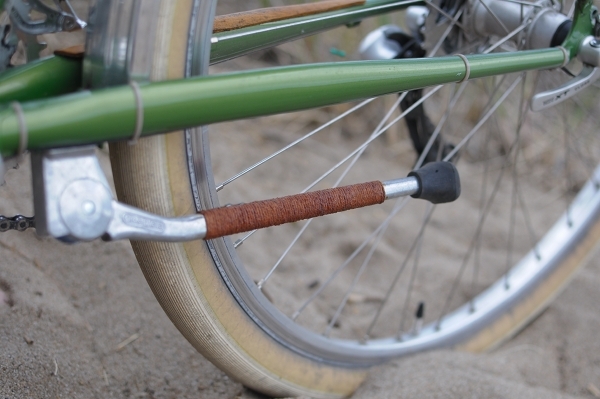 Better than Schwalbe Delta Cruisers. Better than the famous Fat Frank and Big Apple tires. Faster too. It is worth getting 650B wheels just to get these tires. They are cushy, stable, sufficiently puncture resistant (so far), and are just as fast as narrower road tires, yet can go off-road. Almost too good to be true! Also, keep in mind that the width will enlarge your overall wheel diameter - making 650Bs nearly as large as 700Cs with standard, narrower tires. Something to consider if the only thing keeping you from 650B is their slightly smaller size. With the Grand Bois Hetres, they will no longer be smaller. Grand Bois tires are hand made in Japan and are of extremely high quality. Aside from the fat Hetres, there is a range of other models available, suitable for various wheel sizes. 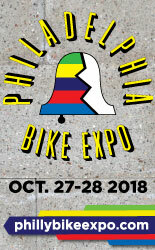 In the US, these can be purchased from a handful of bicycle shops (if you are in Boston - Harris Cyclery had some the last time I was there), or from here directly. If you love the idea of a go-anywhere bicycle that is fast on the road and perfectly at home off-road, the Grand Bois Hetres are surely as good as it gets. Of course, it doesn't hurt that they are beautiful - even after 1800 miles! I just wanted to be first. Great looking tires! Wish I was at the beach. Have you had flats in the 1800 miles? 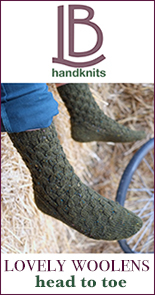 Those do look nice--I couldn't get them on my bike, but maybe the "Cypres" would work. Wondering how much puncture-resistance I'd have to give up for a cushier ride. My Vittorias are all right, but with camera gear on the bike, less vibration would be a good thing. I concur! I love, love, love them - dirt and all. Stand over clearance is a close one for me because of the height, but I still clear, and I think they are totally worth it. Moopheus - No flats after 1800 miles. Hope I didn't just jinx it though! The puncture protection on these is considered to be excellent, so I don't think it is a matter of trading cushiness for it. 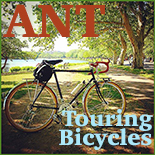 Glad to finally hear from someone who has ridden on Vittorias - I had been wondering what the white Randonneurs were like. Beautiful. I need a road bike. I think the circumference of the Grand Bois is around 206cm (from my memory of setting up the Cateye). 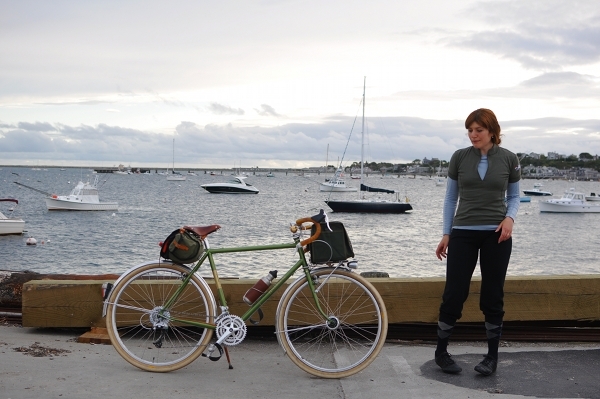 If I recall (this was even longer ago), my 27" Motobecane w/ Gatorskins is 216cm and my Pashley with 28" wheels was 226cm. 700c tyres fall somewhere in the 214 to 216cm range. ...which is to say some 700c are skinnier, like 210cm, which brings them even closer to the Grand Bois. I made a math error in my head, now that I think about it, it makes more sense. At some point I erroneously thought Grand Bois were larger than skinny 700c, but I guess, instead, they are smaller--but nearly the same size (with vastly more air/cushier ride). And re Hetres...great except in slush and snow, even with low Jan Heine approved pressure. Cross tires for snow, Hetres for everything else. Nice! 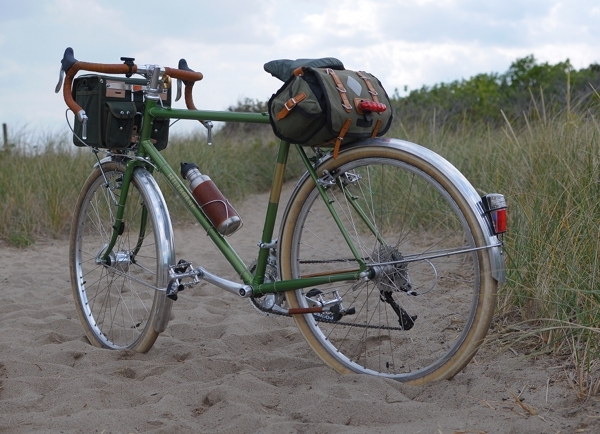 I've got another old mixte that I'm going to build up one of these days, and would like to have some cushy tires for it. I'm replacing the wheels on it anyway, so maybe these are something I should consider. @rural14. cool, I will do that for sure! Thanks for the comparisons to the Cypress and the feedback re Col de la Vie; wish I had enough money and bikes to test them all! grand bois-gush! I only wish I had a 650b wheeled bike with clearance for the hetre. @Matthew - Did you change your gears? Re col de vie...decent in snow, but compared to hetres on the road...dead and slow. Noisy tread too. When they were the only avail option after trimlines were discontinued, well a good stopgap. But once the hetres came along, no reason to use. A lot of great feedback re the new pacenti tire, and also there's a new 650 from soma. So I think now a lot of great options. Graham looks great in the grand bois. Fantastic. And just to tie this post with the the previous one (on twining and trends) -- I love the twine on the water bottle. It's just gorgeous with the handlebars and the bags. I wonder if you've noticed whether it adds an insulating benefit at all? The Grand Bois tyres make me want a 650b bike. No other tyre out there makes me want a bike to go with it. That's as strong of an endorsement as any. Are there any cushy equivalents of these that would go on 700C? 650b is a little odd looking in large sizes; but I have a 59 cm 650b bike that looks just fine, and had a 62 cm saluki; it looked fine, but more importantly they both rode very nicely. A big piece of this is that the Hetres are somewhat like old tubular tires...fast, cushy and supple; so if you want to keep your current bike, get an old set of tubular wheels and decent tires, and see what it's like. In theory, Jack Brown Green tires are like Hetres (in cross section which is what I think gives the Hetre's their magic) but in actuality they don't ride as nicely (in my opinion). The Grand Bois in 700c are about as good as it gets; and I've also heard that Parigi Roubauix are great (am about to try a pair as my Grand Bois are worn through). But try the tubular wheelset...that's a giant step up in what the bike feels like, and even though this is contrary to a recent Grant Pederson musing, I think the lighter a wheel set and tires are, the better (except for off roading, so that's a big exception). No, I didn't change gears. Gearing is already a MTB-esque 48X38X26 front and 28-14 rear (7 spd freewheel). I didn't see much reason to go higher, and wasn't even sure if it would behoove me to do so. 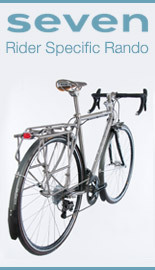 The bike was originally equipped with 38's and a riser bar - I swapped the handlebar out for drops and bar end shifters. When you say they are almost as wide as 700C, was that what you previously had fitted to the bike in the pictures? Just trying to get an idea of what the overall fender clearance might be like for a 700c Bike. Also, I was in the Grand Bois shop in Kyoto last fall. Quite a nice little place. "No, I didn't change gears." "Gearing is already a MTB-esque 48X38X26 front and 28-14"
Far from MTB-esque gears I would say that's an excellent and intelligent road bike range. Most road bikes are grossly over geared, even for racing. 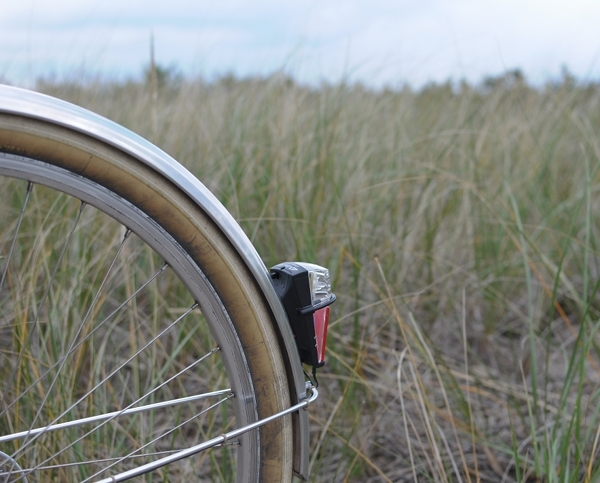 I just put Grand Bois Hetre tyres on my 52-cM Saluki (SKS P45 mudguards work fine here). Wow! I can't believe how much more fun my ride is! These tyres really are fast and comfy and lively. I've had them on and off road in Scotland and I love 'em. I had been riding Col de la Vie 38s. The Grand Bois tyres are so much much better. Was curious if you're running a carradice expedition rack under your trunk bag, and also what model of bag is that? Is it the Barley?